When intestinal balance is disrupted by modern diet, chlorinated water, stress, or medications, a yeast overgrowth may occur, causing symptoms like fatigue, weakened immune function, and problem skin. 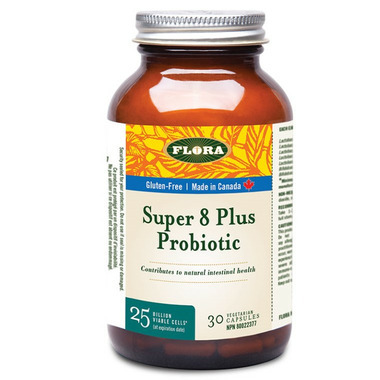 Super 8 Probiotic Blend delivers 25 billion viable cells per capsule at date of expiry. Flora Probiotic Blends help support the growth of a healthy natural microflora. These friendly bacteria are necessary for limiting the proliferation of undesirable bacteria, fortifying the immune system, while helping the body carry out the digestive process as nature intended. This product has come into contact with milk and soy lecithin. Do not use this product if you have a milk or soy allergy. Discontinue use and consult a health care practitioner if symptoms of digestive upset (e.g. diarrhea) occur, worsen, or persist beyond 3 days. Keep bottle refrigerated. Keep out of reach of children. I used this product before but I bought it from Whole Foods - quite expensive there. i love the product as it works very good for me. Easy to take. Reliable. I like all their products!